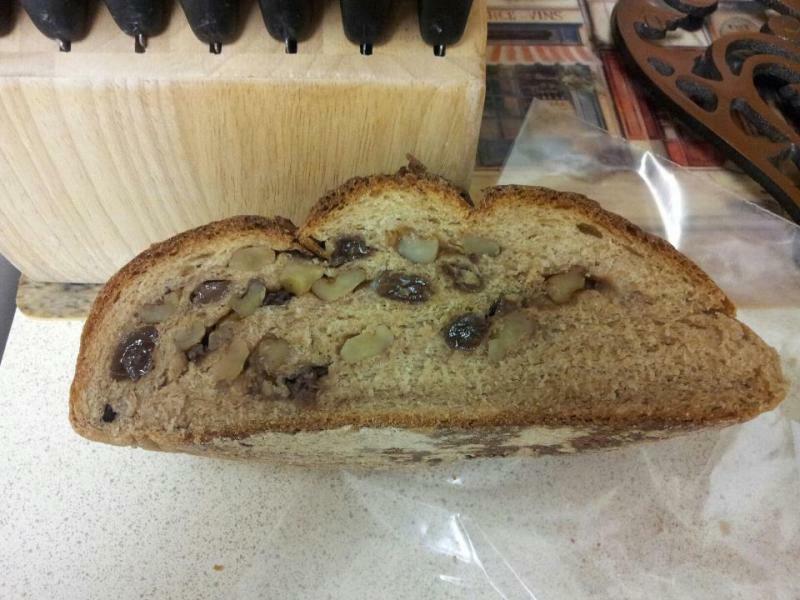 I have never made this loaf before, but I do know from experience that it is difficult to evenly distribute inclusions like raisins and nuts into dough. You can't put them in at the beginning of the kneading process because they will hamper gluten development (or will be flying all over the kitchen if you are hand kneading) and when you do add them at the end, they are all the more difficult to incorporate because now the gluten is developed and is offering them resistance. Stretch and folds during the bulk ferment help a lot to redistribute inclusions because the gluten is relaxed and provides less resistance. Judging from your dough in the bowl pic and your crumb pic, it looks like your dough could have done with more gluten development. What flour were you using? Thanks for taking the time to reply to my blog. I used King Arthur whole wheat flour. When you say "bulk ferment," do you mean the first rise? 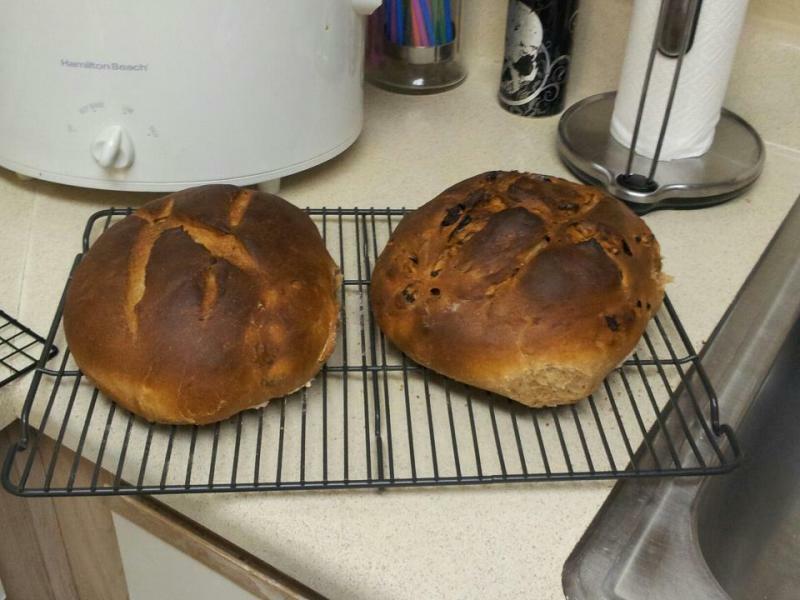 The second time I made this, I kneaded the dough a little longer and that did seem to help the rise. Yes, by 'bulk ferment' I mean the first rise. So you would want to give it at least two (maybe three) stretch and folds during the bulk ferment. If you are unsure, check out this video on how to handle dough during the bulk ferment. Are you using the Bread Bible by Rose Levy Beranbaum? Are you referring to the Raisin Pecan Bread on p.404? If you are using 100% whole wheat, expect it to be quite a bit denser than an all-white loaf. Why don't you try using a 50/50 mix of bread flour and whole wheat. Make a sponge out of the whole wheat portion of the flour before you add the bread flour. First develop the gluten by kneading for, at least, five minutes before adding the raisins and walnuts. Then do some folding of the dough during the first rise to strengthen the gluten. No, I'm using Beth Hensperger's bread bible and the recipe is on pg. 86. It does call for, and I did use, some unbleached all purpose flour (King Arthur as well), but I have bread flour so I'll use that on the next attempt. I've never folded dough before; I thought you weren't supposed to touch dough while it's rising. I'm looking forward to watching the video (I can't get it to open on my phone right now). Thanks again! King Arthur all purpose should be fine. Google 'folding dough' and you should come up with a few videos that demonstrate the same technique. The Milawa Factory one is great, too. Having watched some of the videos, Syd, it definitely makes a lot more sense. I can see how stretching and folding would help, but isn't the same as punching down the dough. I also don't know why I haven't thought to use "shoe box"-esque Tupperware for my dough risings before. Genius! Thanks again for the help, Syd. You're welcome Shutzie. It isn't quite the same as punching down however the intention is the same. It is done to expel some of the CO2 and also to strengthen the gluten. It also has the added advantage of redistributing the temperature of the dough by folding the (colder) outer dough inwards and the (warmer) inner dough outwards. It is more gentle than 'punching down' and will lead to a lighter, airier loaf. You don't want to destroy all those gas pockets. Watch this video for some explanation behind the technique. the way I like it. The crust ends up the way it does when the middle of teh bread gets done. Some vital gluten may have helped the rising. It sure looks tasty. Gluten development issues seem to be the consensus here. It was, in fact, tasty though.